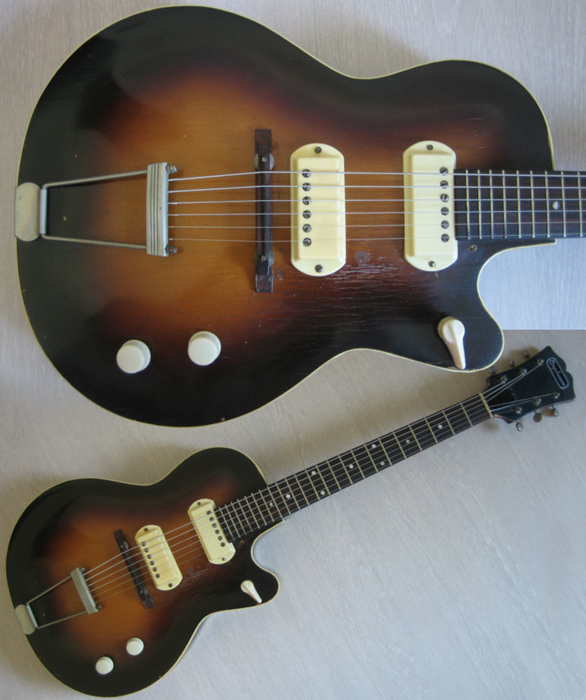 I have very little to tell about this Orpheum hollow body guitar, but that since it's labelled 'made in USA', it might have been made by Kay or Harmony - these two companies have made Orpheum branded guitars before their construction switched to Europe in the 1960s (Wandré then Egmond). Later on it went to Japan but it was used for Guyatone, FujiGen or Teisco made solid bodies. It's a Premier guitar, relabeled for Orpheum. I'm sorry, not the bridge, i meant the Saddle. Actually upon closer inspection, I can kind of see the original footprint. It was at one time setup properly, but i'm guessing that's a floating bridge, and whoever restrung it last didn't know what they were doing. Good guess at yet another nice old mystery guitar! The pick-ups look like dog-eared P-90's. The top number starts with a "G" and denotes the model. The bottom number is usually a two digit number for the year. According to some, Guild used Craftsmen from United Code to finish some of their Guitars. Not a whole heck of a lot is known about United, or United Code (pronounced ko-day) other than at one time they were owned by Frank Forcillo and operated out of Elizabeth New Jersey beginning in the late 1940's. There was a connection between Guild and United and even D'Angelico and United that went on for quite a while, someHistorians say that Guild had United finish some of their first Guitars.. United Code was very much a US Company, Frank Forcillo worked with D'Angelico in Little Italy and applied for a stringed instrument patent in 1948 in the US Patent Office. When John D'Angelico finally gave in and began producing Electric Guitars, He asked his Friend Forcillo and United Code, to make laminate body's and finish them after He supplied the necks. The theory is that there was a lot of give and take at the time, and that most of the Luthier's, especially Italian Luthier's knew each other and helped each other, maybe the "United" name, owned by Forcillo, was a Sub Contactor of sorts.